There are many theories about the birth of landscape garden, and today I will take a deeper look at the one proposed by Ippolito Pinedmonte, an Italian poet born in Verona in 1753, that originated from a meeting of the Science Academy in Padova in 1792. In the first part of his dissertation, the poet offers a description of what can be considered a landscape garden. He lists every element we would find in these kinds of places, such as hills, lakes, trees, of course, and ruins etc. The second part of the text is dedicated to his personal theory about the origin of this kind of style. Looking at the past, the author doesn't seem to see any evidence of irregular gardens in the antique examples, so he begins to search for a description of irregular gardens in literature. And imitate her imitator art. To strengthen his theory the author says that Milton himself surely knew well Tasso's poem, and took from it his idea of an irregular garden. 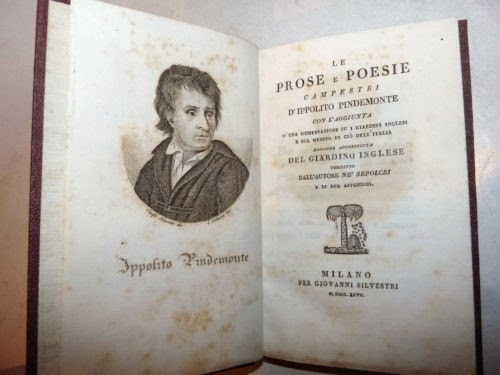 Pindemonte, Ippolito. Dissertazione sui giardini inglesi e sul merito di ciò dell'Italia. Padova, 1792. Tasso, Torquato. La Gerusalemme Liberata. Venezia, 1580.